As promised, here is part two of our Mindset series. In this post, we’re going to explore how people cultivate a Fixed or Growth Mindset in others. As a boss, coach, parent, or someone in a leadership role, you have the ability to impact the mindset of others, and what you say matters. The type of feedback you offer, questions you ask, and praise you give can determine how an employee, athlete, or child sees themselves and develops over time. Specifically, when someone succeeds at a task, it is their time to shine and it’s imperative that you are there to comment on their achievement. Think about an eight-year-old running up to you with a perfect score on a spelling test. What do you say? “Holy cow!” “Great job!” “You’re so smart!” Those come to mind easily and we’ve heard them a thousand times. But what are we reinforcing with those comments? We’re emphasizing the end result, the success, the innate intelligence that caused a good grade. While our intention may be to build their self-esteem, in reality we may be encouraging them to develop a Fixed Mindset. Those are the wrong targets, and as the one providing the praise, we hold the most important position in this conversation. 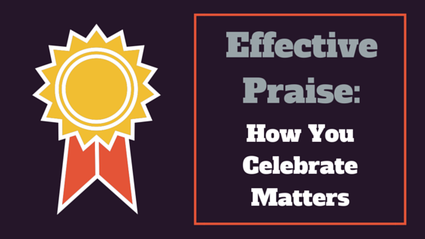 Instead, it’s imperative that we praise what was done to achieve the success. Why did this child get a perfect score? Was it the type of studying he did? The practice writing legibly with correct spelling? Effective praise shows that you were paying attention to the person’s process. It is genuine and heartfelt, highlights the steps taken to achieve success, and celebrates hard work instead of just the finish line. Try this: “Wow! Your hard work and studying so many words paid off. Congratulations! Keep up the effort!” Think about the implications of that slightly longer and more specific response, particularly if this type of response is replicated for other successes. You’re now in the business of cultivating a Growth Mindset – when this child grows older and receives more difficult assignments, he will know that effort brings success and studying will become second nature. If he trips along the way, he won’t give up – because failure is just a small setback on the road to success. He’ll be empowered to seek out assistance when needed, because he knows that he is capable of learning and getting better. Most importantly, this mindset will then trickle over into his sport, career, and life. Powerful, right? We know that effective praise sounds like common sense, but unfortunately it is not common practice. It’s a relatively simple concept that requires repetition, emphasis, and intentionality. So often you’re juggling a million things and the only comment you can manage is “good job” in order to finish making dinner, get to your meeting on time, or move on to address the team huddle. In that moment, pause. Choose your words carefully. Why? Because your words have the ability to impact a person’s self-esteem, motivation, ability to learn and achieve, and so much more. Abby Keenan is a certified mental performance consultant located in Atlanta, GA. She specializes in mentally preparing athletes to perform at their best when it matters most. To work with Abby on mindset coaching or effective praise, visit intrepidperformance.com/contact.